Housing and Urban Development Secretary Ben Carson, who has faced intense scrutiny and even calls for his ouster over a furniture order, said in an interview with The Daily Signal that his reforms at the agency prompted such pushback. “I have no intention of going anywhere,” @SecretaryCarson says. “If you don’t disturb things, no one is going to hoot and holler,” he added in the interview Monday. Over the last year, Carson said, he implemented changes at the Department of Housing and Urban Development to focus on helping recipients of government aid become more self-sufficient, deregulating where possible, and strengthening partnerships with the private sector. President Donald Trump nominated Carson, a former rival in the large 2016 field of Republican presidential candidates, to be the nation’s 17th secretary of housing and urban development. HUD, which currently has a $40 billion budget and more than 8,000 employees, was established in 1965 to provide housing for the poor as one of President Lyndon Johnson’s “Great Society” programs. HUD programs include rental and mortgage assistance, but have grown over the years to touch on environmental, health care, and employment issues. 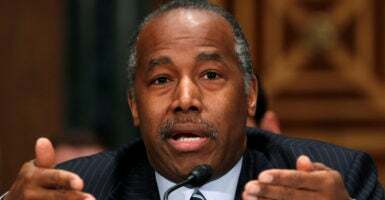 Carson, 66, recently has pushed financial integrity reforms, which he said is largely in response to the controversy over HUD’s order of a $31,000 mahogany dining room set for his use. House and Senate committees last month grilled Carson over the flap. House Oversight and Government Reform Chairman Trey Gowdy, R-S.C., requested documents. Sen. Elizabeth Warren, D-Mass., went further, though, by calling for Carson’s ouster. “I have no intention of going anywhere,” Carson told The Daily Signal. Also last month, Democrats who are members of the Congressional Black Caucus wrote a letter to Carson criticizing plans to change wording in the agency’s mission statement. Carson said he is pushing more oversight of HUD expenditures to try to prevent a recurrence of something like the furniture purchase. Carson told the House Appropriations Committee in March that he and his wife had looked at a furniture catalog while considering redecorating his office, but left details to staff. He said they were both surprised upon seeing the price tag for the dining room set, and canceled the order. Carson last month hired Irving Dennis, a former partner at the accounting firm Ernst & Young, as HUD’s new chief financial officer. 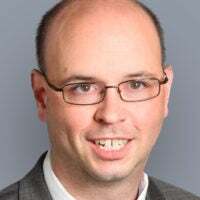 He said Dennis will lead an internal task force to fight waste, fraud, and abuse through increased transparency and accountability at the agency. The new financial integrity plan moves beyond addressing problems such as the furniture and will consist of ensuring agency-wide oversight; restoring more accountability for financial reporting; and modernizing the grant process, according to a HUD press release. HUD already has undertaken efforts to reduce improper payments, firing 41 inspectors in 2017 for not doing their jobs properly, according to the department. It also made changes to avoid a taxpayer bailout of the Federal Housing Administration and ended the Property Assessed Clean Energy loan program. “I would call it a more logical agenda that makes sense, as opposed to any ideological agenda,” Carson said in the interview. On another major front of reform, Carson said he plans to open 10 more EnVision Centers across the country in 2018. The centers, located in public housing facilities, leverage private money for education, job training, financial literacy, and mentoring programs. This is part of the four pillars of self-sufficiency that HUD is promoting, Carson said: character and leadership, educational advancement, economic empowerment, and health and wellness. Carson stressed that the EnVision Centers are about breaking intergenerational cycles of poverty. Examples, he said, include linking single mothers with child care resources so they can complete their education and matching volunteer mentors with those who need mentors. HUD has been part of the Trump administration’s deregulatory agenda, issuing 19 regulatory waivers to expedite aid to areas hit last year by Hurricanes Harvey, Irma, and Maria. HUD also will tackle reforms for government-sponsored enterprises such as Fannie Mae (the Federal National Mortgage Association) and Freddie Mac (the Federal Home Loan Mortgage Corporation) to avoid future taxpayer bailouts.